Perceived Obsolescence is when a customer decides to upgrade a product, because the one he / she owns, is considered out of date, even though it still works. Manufacturers try to persuade potential customers to update / upgrade an existing product. This is often carried out through advertisements, that imply the customers ‘existing’ product is old fashioned and that he/she needs the new product. Central to ‘perceived obsolescence’, is the customer’s perception of himself / herself. Manufacturers try through advertising, to ‘plant’ the need for the potential customer to upgrade to the new product, so that their personal image is ‘ ‘enhanced’. 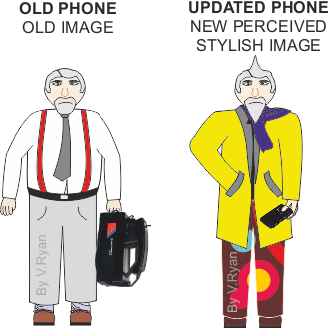 A customer with a mobile phone, has been persuaded through advertising, that a new hi-tech smart phone will enhance his personal image. The old phone works well, but he now thinks it is out of date and regards it as old fashioned.